This tutorial is focused on the development of a CRUD & RESTful web application with MSSQL and ANGULAR-JS. Node.js is a very cool platform to seriously consider also for our enterprise projects. I have tried a lot of libraries to find an optimal setup to develop an enterprise application. This tutorial will guide you in the implementation of a strong and easily reusable platform. 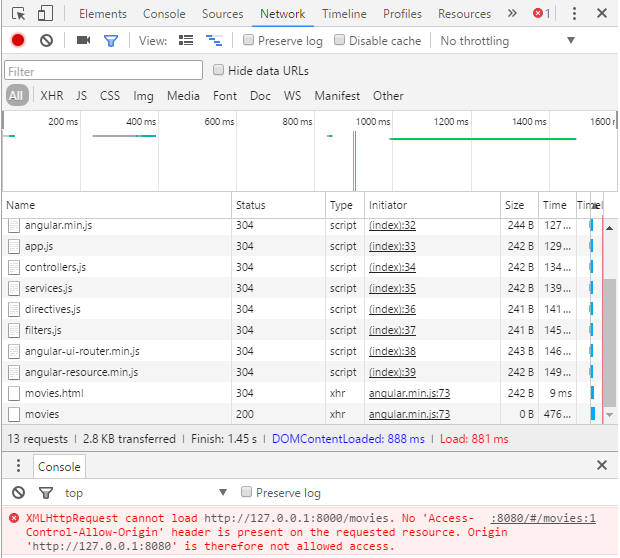 This tutorial is focused on the development of a CRUD & RESTful web application with MSSQL and ANGULAR-JS. .
Part 4 - Cross-origin resource sharing and usage of Access-control-allow-origin. A production test bed. Node.js is a very cool platform to seriously consider our enterprise projects. I have tried a lot of libraries to find an optimal setup to develop an enterprise application. This tutorial will guide you in the implementation in a strong and easily reusable platform. No films are listed. Why? In our test environment, we have two http server one is the web sever and respond on port 8000 and, the second one, is the data server and operates on port 8000. They are two different servers that reside in the same host. In a real environment, it's possible that the two servers operate in different hosts and they can also reside on different locations and/or domains. This has a strong impacts in the security of our application. The methods GET, PUT, POST and DELETE of our data-server may be called from a hostile application that, for example, get - every day - the list of our films and then deletes them. By default Cross-Domain AJAX requests are forbidden. This is right when we need to assure that only our MovieApp can interact with the data-server. It means: permit to every web site (or every web client) to consume our data-service. It says that the component XMLHttpRequest cannot access to our data service due it declares that our MovieApp web server is not allowed to access. Note that in the last row of the list of Network tab, the request for movies declare 200: there is not an http error! The data server respond correctly, but Chrome rises a CORS exception. In Internet there are a lot of very-simplified examples using the technologies used in this tutorial: node.js, Angular.js, MSSQL, etc. Following this post we have seen that when we try to implement them in a real production environment we must consider some different aspect to make a working app. We have seen what is "Access-Control-Allow-Origin" and how it may be set up. Googling technical forums you can see a lot of people that can't run node.js application due CORS constrains.... Cross-Origin resource sharing is not a complication, but a useful mechanism to help us to write reliable application with node.js. Download MSSQL Express 2014 from Microsoft site. I suggest the SQLEXPRWT version, so there is also Visual Studio inside. Install it with the default setup, choosing hybrid authentication. Open visual studio and create a new DB named SampleDB. Note that the truncate table command is used only to obtain records with the _id enumerated 1, 2 and 3. 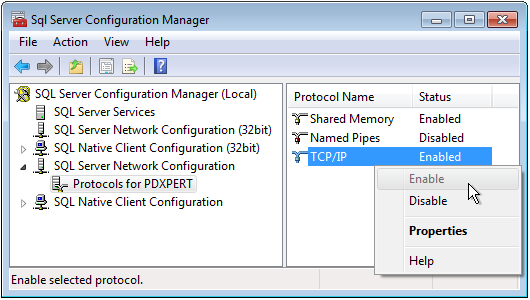 Set up the firewall for MSSQL protocols or temporarily disable it. 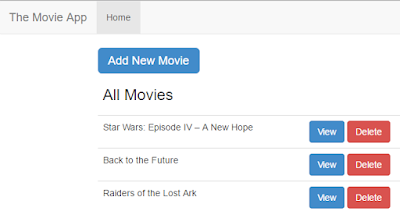 Our DB is ready and it's compatible with the attributes and datatype required by the MovieApp that we have seen in part 1 of this tutorial. Goggling the web, I have found a very nice tutorial How to develop a complete REST service application using pure Node.js. Read it to understand well the anatomy of a real RESTful service application. Using the console go inside our MyApp folder and type npm install . We have installed the library MSSQL. Now we need to adapt the server to our entity movies. Download these files from github. Unzip and it and copy the content of folder MSSQL_CRUD_RESTful_ANGULARJS-master in our MyApp folder, replacing all preexisting files. Now we need to change the password in the file settings.js replacing mypassword with the password of user sa (system administrator) that you have chosen during MSSQL Express installation. Save it. It's time to see our data server in action: open a new console and type node app . 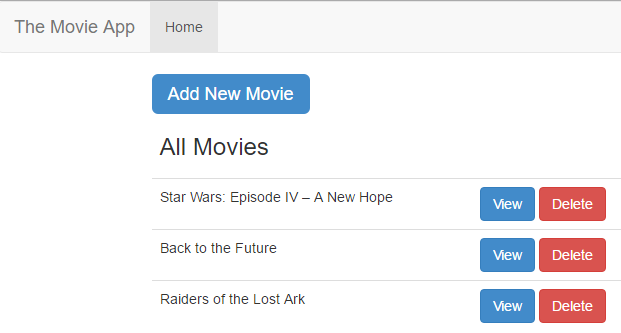 Now open Chrome and browse http://127.0.0.1:8000/movies . That is the json content of our movies table in MSSQL. Our data layer is working well. If not, double-check the exact sequence of operation of this paragraph. If you see inside the service.js file the link to data server it's changed in http://127.0.0.1:8000/movies/:id. This means that now we are disconnected from previous Internet data service and that we are ready to consume the local data service. 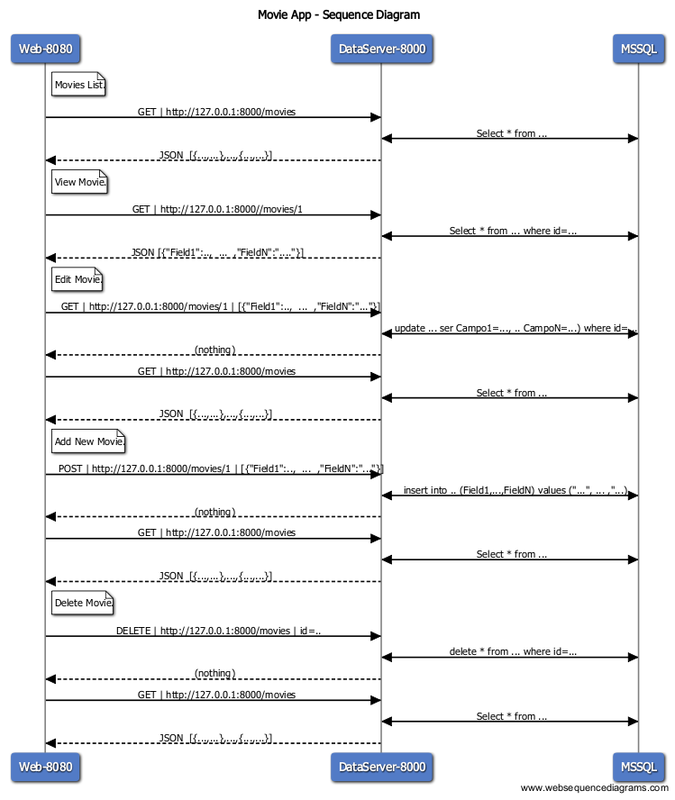 Launch the web server as seen in Part 1. Open a different console, go to the MovieApp folder and type . type   node WebServer. Enjoy it and try every application button! Read the tutorial  "How to develop a complete REST service application using pure Node.js" it explains how to use MSSQL sever to do basic CRUD operations, there is also a video for you. We have created a complete local CRUD, RESTful and SPA application. In the next post I will show  how it's implemented and why it was necessary to respond to the OPTION request from our web application and then what is necessary to isolate the web server from the data server. The first requirement that I have considered is the use of a relational database. A large part of enterprise data are normally stored in a relational database, I think that it's better to interact with it directly. I have choosen Microsoft Sql Server that is one of the most used DB (see also Gartner Quadrant). I appreciate a lot Mongo Db and I prefer it for a classic web site but, for an enterprise application, I prefer MSSQL. The next release of MSSQL-2016 will contain a native JSON implementation. This will simplify the usage with NodeJs, maintaining the advantages of stored procedures, powerful views, scheduler, SSIS and all the other tools and facilities available. There are a lot of libraries that help the development of UI. One of the platform most used is AngularJs. It aims to simplify the development and the testing by providing a framework for client side MVM (Model View Control) and MVVM (Model-View-ViewModel) architecture. With angular we can develop a SPA (single page application) in a few minutes. A lot of software engineering now use a CRUD & RESTful approach when they implements a new NodeJs application. This approach has a lot of advantages also if it is not so "instinctive" for traditional developers. This tutorial will guide you to write an application with a complete isolation between the web service and the data layer. I prefer to separate these two distinct layers because so I can choose different components for the http server and also to enforce security. It's possible to assign these layer to a two different and specialized hosts; they may reside also in different geographical sites with a lot of vantages in deployment flexibility and security assurance. I've googled a lot the web to find a single tutorial with these requirements, but is not easy to find it. So I have selected two separate examples as the base of this tutorial. Evidently the demo address is changed! Now try again and you can see that the app is ok.
Read the tutorial "Creating a CRUD App in Minutes with Angular’s $resource" to enhance your skill in: Angular Js, rest app, spa, $resource; it's the best tutorial that i've found on the web. We have installed a good example of a CRUD, RESTful and SPA application in our host and we have adapted it to consume a data service from an external demo site on the Internet. In the next post we will see how to provide the data layer with a local and isolated service.